Good morning. Well I cannot lie, I am excited over a new product. I am talking about Spectrum Noir Aquatints. They are just bursting with colour and very versatile. They can be used neat, with gesso, caught in crystal, faux bleaching, stamp with etc etc etc. The list goes on and on. I feel very privileged to have been able to play with these for a while and hope that everyone likes the results of everyone's samples and soon enjoys playing witht them too. Sheena is on create and craft with these and some of he new stamps and stencils over the weekend. 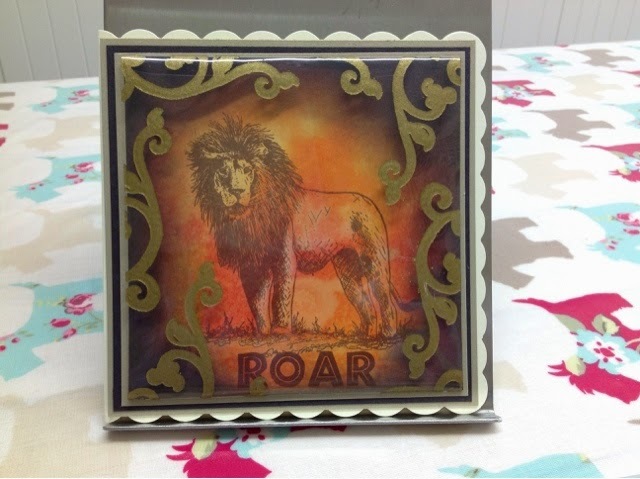 My first sample is using the Aquatints for the vibrant background, Sheena's new lion stamp, edges distressed, over lay with stamped acetate.